Kirk is a Melbourne born Australian musical icon. He has been a member of Australian band INXS since they started back in 1977 and together they have sold in excess of 35 million records worldwide. After the death of Michael Hutchence in 1997, the band were compelled to continue and after working with various singers such as Terence Trent D’Arby, Jon Stevens & Jimmy Barnes they embarked on a world wide search for a new lead singer through the use of a reality based TV show called “RockStar INXS.” It aired live all around the world in 2005 and was the first TV show ever to have worldwide live voting. The show was a huge hit around the world especially in the U.S., Canada, Asia, NZ and Australia. It fundamentally influenced and changed the format worldwide for all “Talent Shows” from there on. The winner of “RockStar INXS” was JD Fortune and the day after the shows finale, they went straight in to Westlake Studios in LA and recorded possibly INXS’ most diverse album to date, “Switch.” They then toured for 2 years with sell-out shows across the planet, which led to a well-deserved break from touring. Unable to sit idle, they went into the studio to record probably their most ambitious album to date, “Original Sin” which saw the band pulling apart some of their most famous songs and re-imagining them - enlisting a different singer on each track with the likes of Rob Thomas (Matchbox 20), Pat Monahan (Train), JD Fortune, Tricky (Massive Attack) and Ben Harper to name just a few. They toured this Album extensively around the globe through Sth. America, Canada, Nth. America, Europe & Australia with JD Fortune again on vocals and picking up some of the other guest vocalists on the album in cities along the way. 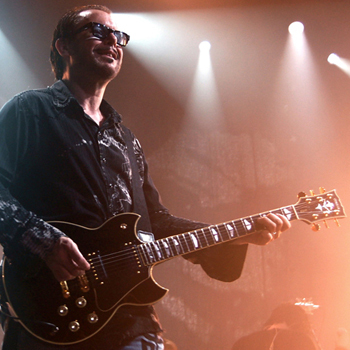 At the end of the Tour in 2010, INXS and JDF parted ways for JD to pursue a solo career. Again, INXS unable to sit still, found a new comrade in Ciaran Gribbin, an established and well respected singer/songwriter from Ireland that Andrew Farriss had met at a party on the Northern Beaches of Sydney. Ciaran and Andrew started writing songs together and the Band then went onto Tour in many locations around the world including an almost full circle Pub & RSL tour up and down the East Coast of Australia road testing the new material. This lead to INXS co-headlining with Matchbox 20 in late 2012 on a sell-out Arena Tour in all Capital Cities in Australia. Next up, INXS were involved with the making of a 2-part TV Biopic Mini-Series based on their extraordinary career up until the death of their charismatic singer Michael Hutchence. Tim Farriss was elected to represent the Band and oversee the production as Co-Executive Producer to make sure they got the facts right. They did, and “Never Tear Us Apart” became one of the highest rating Television events of 2014. This reinvigorated their back catalogue sales which then broke all sorts of Australian records, no pun intended. At one point they had 7 of their albums in the ARIA Top 20 and the No. 1 & 2 spot with “Best Of” and “Kick.” The series has since aired in Nth. America, South America, parts of Europe and NZ to further rave reviews. INXS have now taken a long, well deserved break from touring and recording. But knowing these guys, there inability to sit still may get the better of them before to long….